Production and transportation of carbon-dense, dirty energy fuels across the Northwest increasingly threaten the health of people, places, and the planet with their risky and toxic byproducts of polluted air, water, land, and policies. Incoming Alberta tar sands megaloads and pipelines, expanding hydraulic fracturing (“fracking”) for natural gas, and outgoing coal trains bound for West Coast export crisscross our region, as they transform our continent into a resource colony for Asia and beyond. Our governments consistently fail to defend us from the ravages of Big Oil, Gas, and Coal, as multinational corporations plunder our public resources, taxpayer coffers, and civil liberties in pursuit of their billions in profits. Because conventional avenues for citizen recourse to corporate crooks and colluded public officials predictably succumb to industry influenced rules, laws, and elections, Northwesterners must challenge this corruption and confront the root causes of ecological and economic oppression and devastation in more creative and assertive ways. 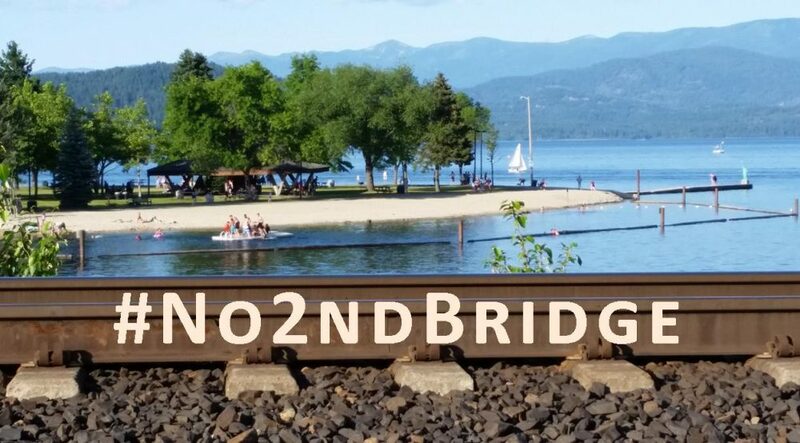 On Friday and Saturday, June 8 and 9, Backbone Campaign and Wild Idaho Rising Tide enthusiastically invite you to push back the boundaries of your community’s resistance to industrial invasions, with new allies, tactics, skills, and strategies. Direct action trainers Jasmine Zimmer-Stucky and Kim Marks of Portland Rising Tide and Bill Moyer of Backbone Campaign will offer you and your co-participants from throughout the four-state area the knowledge necessary to stand up to, stall, and stop the forces that are destabilizing our climate and destroying our democracy. Covering basic information about what direct action is and how and where it can be used effectively and strategically, this session will teach skills such as forming affinity groups, creating consensus, considering legal implications, planning actions, and de-escalating and managing conflict. The training will provide a history of the direct action movement, access points for activists to create working relationships, and an introduction to working as a group to establish roles and prepare and stage direct actions. Facilitators will adapt their training to the needs and experience of the workshop group and will lead many interactive role plays based on real life scenarios. This workshop explores the context and methods of direct action: designing strategies and tactics, setting objectives and goals, choosing targets, and building campaigns that create change. It will explain strategic steps towards planning and implementing cohesive, effective campaigns, building a network of alliances, identifying targets, and coherently evaluating what’s working and not working in existing campaigns. This training discusses the use of hard and soft blockades and other techniques for stopping people and vehicles from accessing areas in wilderness or urban landscapes, such as blocking roads, taking over intersections, or avoiding authorities’ reaches. Hands-on training will work with materials, such as U-locks, black bears, and straight boxes, and will convey soft blockade methods using protesters’ bodies. Additional training could include an extra hour focused on the processes of building and using tripods. Through presentations and banner making, workshop leaders will describe how to create innovative messages, spectacle imagery, and political theater. This session in artful activism will discuss the strategic uses of creative tactics, such as coordinated flash mobs, festival arts and music, and other theatrical forms of non-violent direct action. It also serves as a condensed prelude to the more intensive Localize This! Action Camp converging on Vashon Island, Washington, between July 29 and August 4, 2012. At that more comprehensive, week-long workshop, participants can further share and build skills in community organizing, action planning, engaging the media, building props and giant puppets, drumming, rappelling, and using kayaks and water-based tactics. Workshop participants eager to apply their new skills are encouraged to linger and partake in an Occupy Spokane community tabling event, We Can, Spokane, on Sunday and perhaps a tar sands megaload protest on Sunday night. Occupy Spokane and allied regional organizations will graciously provide all four meals. Workshop participants who have traveled far for these trainings can sleep in the Youth Center on Friday night or stay in local activists’ homes or group spaces or camp at Riverside State Park, ten miles northwest of the workshop. Event organizers have worked to minimize workshop fees such as facilities rental, food provision, trainers’ travel, and organizers’ costs. However, participant donations are necessary to offset hundreds of dollars of workshop expenses. Although no one unable to pay will be barred, please consider contributing at least $20 toward this worthy educational opportunity. 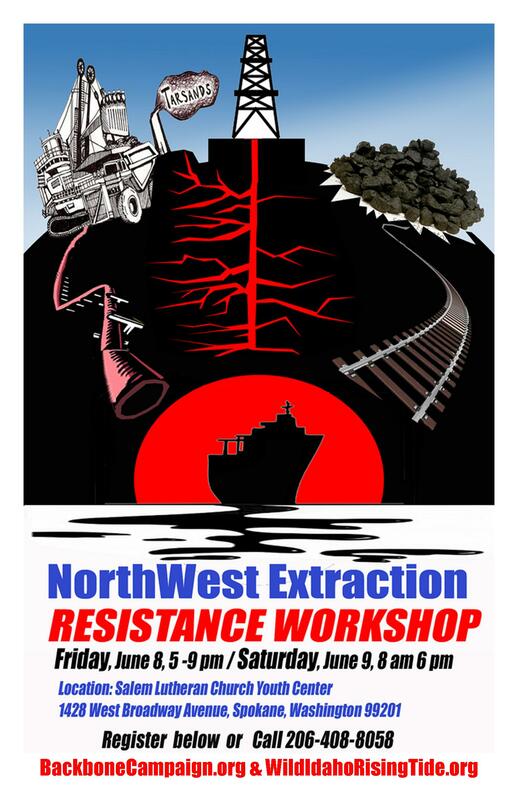 Reserve your spot soon through the registration form, encourage your friends and co-workers to participate, and print and post the tabloid-sized, color Northwest Extraction Resistance Workshop poster. The following is my version of Gene Sharp’s concept of Moral Jujitsu. If you can persist in the face of repression, you communicate to your adversary that what they’re doing isn’t so much bad, which it probably is, as much as it is ineffective. Then you begin to drive a wedge between the liberals and conservatives in power. The liberals moan and complain, “They’re making us look so bad, can’t we think of something to give them to get them to go away?” The conservatives respond, “No, no, no. If we’re a little more brutal, we can break them.” Nevertheless, iF you can persist in the face of repression, you push that wedge further and further between the factions of power. Here’s the key: the better the nonviolent discipline, the further the wedge will go for any given level of effort and sacrifice. The smoother the wedge, the further it goes. The rougher the wedge, the slower it proceeds. What is most relevant for most U.S. practitioners of nonviolent resistance is that because they seem not to see enough value in Gandhi’s approach of suffering in jail to touch the heart of the adversary, their actions are weaker than they might be otherwise. Without repression, as described in “The Power Dynamic of Nonviolence” paragraph above, there is no dynamism. Sure would be nice if someone of you good folks would even address this.